Emigrated from Latvia after WWII. Graduated from (Case) Western Reserve University. Ex-psychiatric social worker. Loves observing life and its ironic twists, and incorporating these in her stories. Believes that every story should help to better equip one in life; to learn something new, and to enjoy that learning. Lives with her family, which includes three cats, in northeast Ohio. Scientific Fairytales for Children: Book One: Little ZerO and Bully 9 is an educational fable for children written by Silvija D. Lechowick. The Community of Numbers lived deep down in a hole in a grassy meadow. The pit they inhabited had little access to the sun’s warmth and even less light, but over time the Numbers had come to consider it their home. They would occasionally try to escape their confinement, but to no avail, and so they had for the most part resigned themselves to calling it their home. They had three rooms to share: one for living, one for sleeping and a third was their larder where they grew button mushrooms. The Community was a peaceful one until number 9 began to think that, because he was bigger than the others, he was better, more deserving and more powerful. He soon began to treat the other numbers harshly. Each of the numbers below him began to follow suit: eight began to bully seven and seven six. The numbers all grew sadder and more stressed with their new relationships but ZerO, the littlest, was the saddest of them all. 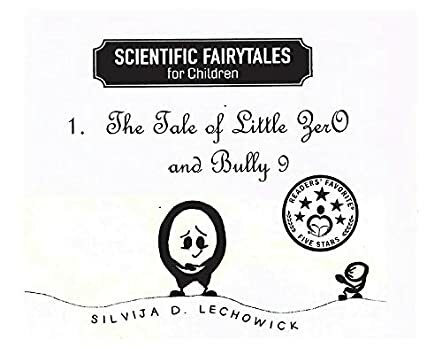 Silvija D. Lechowick’s educational fable, Scientific Fairytales for Children: Book One: Little ZerO and Bully 9, is an entertaining and engaging story about cardinal numbers and their relationships, but it’s also about bullies and bullying. Bully 9’s behavior is shown to have a reverberating effect on everyone in the community, and, unchecked, you can see his behavior only gets worse. I loved witnessing that pivotal moment when someone has the temerity to stand up to the bully. Every schoolyard has its Bully 9 character, and Lechowick’s fable helps kids understand that bullies are not the all-powerful beings they want you to believe they are. Sometimes all it takes is to stand up to them. Her fable also explores the relationship of cardinal numbers and their values in a fun and original way. Scientific Fairytales for Children: Book One: Little ZerO and Bully 9 is highly recommended. A mean person can come from an unexpected place, where you would never suspect, which is what happens with Nine. But as that mean person starts to gain more and more power, they start to think they can get away with more and more. That’s when any mean person can turn into a horrible bully. Even worse, bullies torment everyone, making them believe that they must follow the bully or be tormented just as badly as the victim. But together, anyone can be stronger than a bully. Without fear and intimidation the bully has nothing. Banding together, supporting one another, and saying no to a bully just might be the answer for poor little Zero, but can the others do it in Scientific Fairytales for Children: Book 1. Little ZerO and Bully 9 by Silvija D. Lechowick? This is a book about bullying and standing up to a bully, but it’s told from a perspective that’s a little more fun for a child. Instead of pages of difficult concepts, it’s all about numbers. And it’s easy to see why the bigger numbers might pick on poor Zero, because many people think of it as an insignificant number. But Zero is the key to everything and the other numbers start to realize this just a little too late. If you’re looking for a way to teach your little one about numbers and, even more importantly, about bullying, this is a great way to do it. Each of the little numbers learns how to stand up for themselves, and to stand up for others as well in Scientific Fairytales for Children by Silvija D. Lechowick.